The Coffee Hunters haven’t been blogging much, and we’ve been drinking DFW coffee even less. June has seen some serious travel outside of Texas for the Hunters. One of us headed to Italy and Vancouver (yes, for the women’s World Cup win). The other was seen traipsing around as a summer camp counselor in Arkansas and then was in Louisville, Kentucky for a week. It was there in Kentucky we struck gold. Or more to our liking, coffee. Really good coffee along with wonderful food, all in a fabulous setting. The discovery of the week was a little south of Louisville in the quaint little town of Elizabethtown (E-town to the locals). There the amazing Cobbler’s Café can be found, and what a find it is! 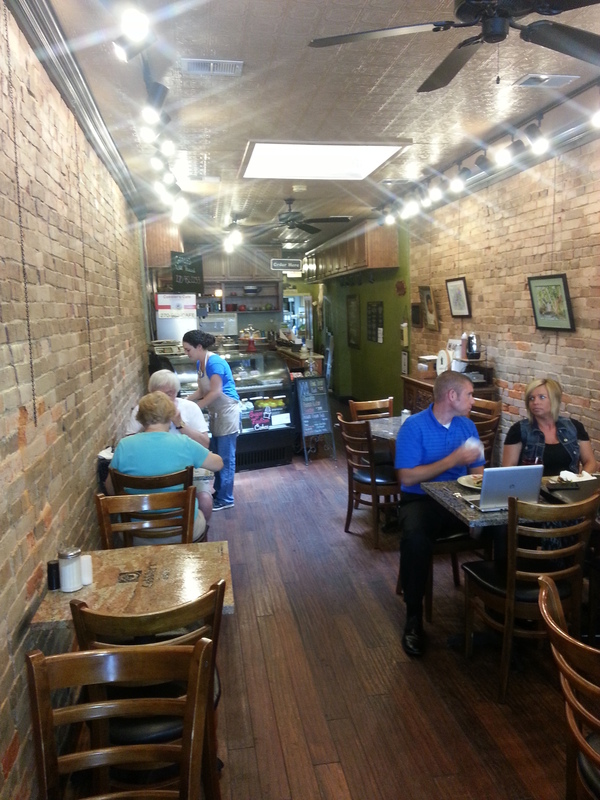 Just how many coffee shops do you know of that are in a building over 100 years old? The Café was constructed in 1878 as a doctor’s office. It is constructed in the classic “shotgun” style of the times, measuring only twelve feet across by eighty-five feet long. Every bit of it is full of history and the flavor of a bygone time. For example, you can still see the original skylight that gave good light for the operating room in 1878. The brick walls you see in the photos are the original walls, made from hand made bricks. It is an incredible building – unique and special in so many ways. From being a doctor’s office the building ultimately became a shoe shop, with a big sign promising shoes and boots could be re-heeled in 3 minutes. That led to even more fascinating history, including letting the building become very run down and dilapidated. By the time the building was purchased in 2002 it was in need of significant repairs. Some said it would never be restored, but its owners, Jayme and Kristi Burden, were determined. They overcame bureaucracy, rotten wood, and even all the crazy rules and regulations the Health Department imposes on an establishment serving food. Somehow, in 2003 the Cobbler’s Café opened for business. That business includes genuine cobbler (that was simply spectacular), cookies, scones, lunch time sandwiches, burgers, fries and more. There is a full menu at the Cobbler’s Café and every bit of it looks scrumptious. An espresso machine from Italy makes sure coffee lovers have lattes, mochas, and macchiatos – all made to perfection. I had a pour over and found a dark Italian roast coffee to provide a mug of real coffee flavor that was just irresistible. 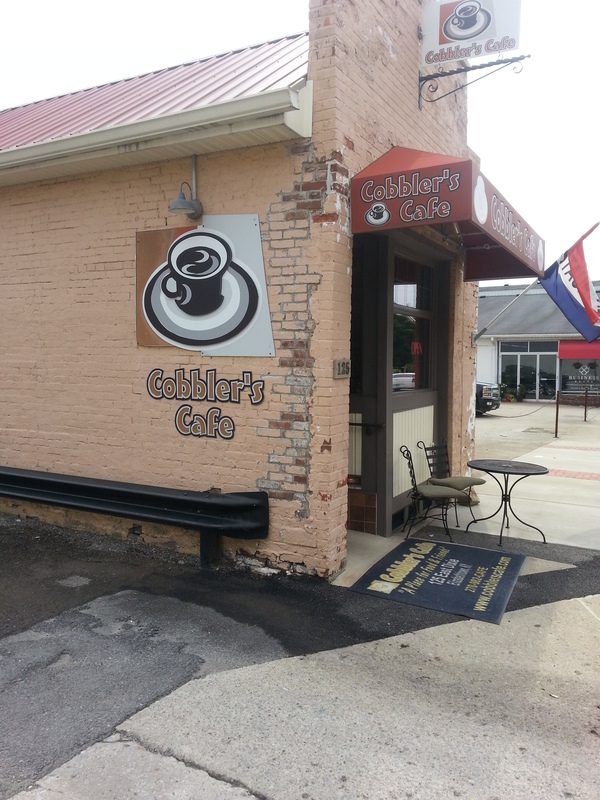 The Cobbler’s Café is the ideal place to pull off the road, get something to eat, or enjoy a cup of coffee while savoring the history and ambiance of the place. You’ll get great coffee and food here and more – you’ll get a chance to relax a minute in a truly unique café. If you are headed to Louisville, you will find Elizabethtown off of I-65 about thirty minutes south of Louisville. Exit on highway 61 and head into Elizabethtown. You can’t miss the Cobbler’s Café as it is directly across from the new courthouse. 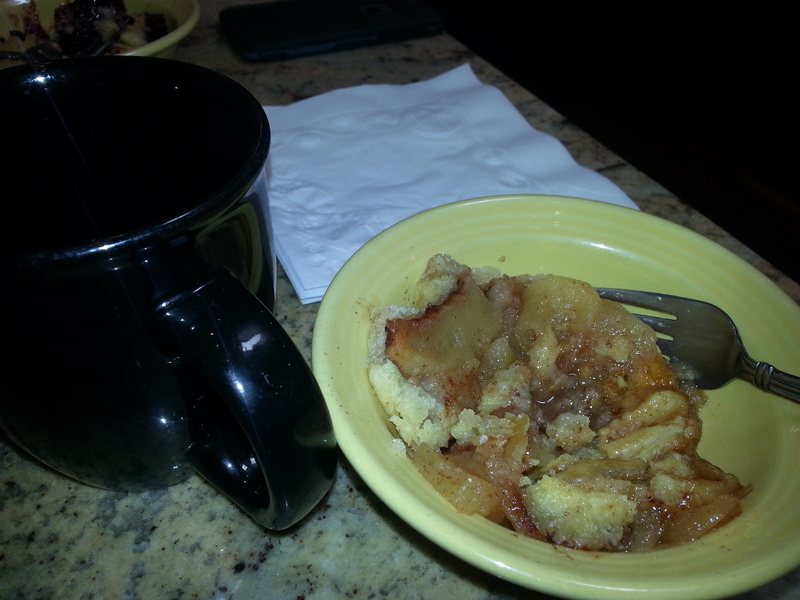 Maybe not everyone reading a coffee blog centered in DFW will get a chance to try the Cobbler’s Café. But we’re always looking for great coffee – here in Texas or anywhere else. 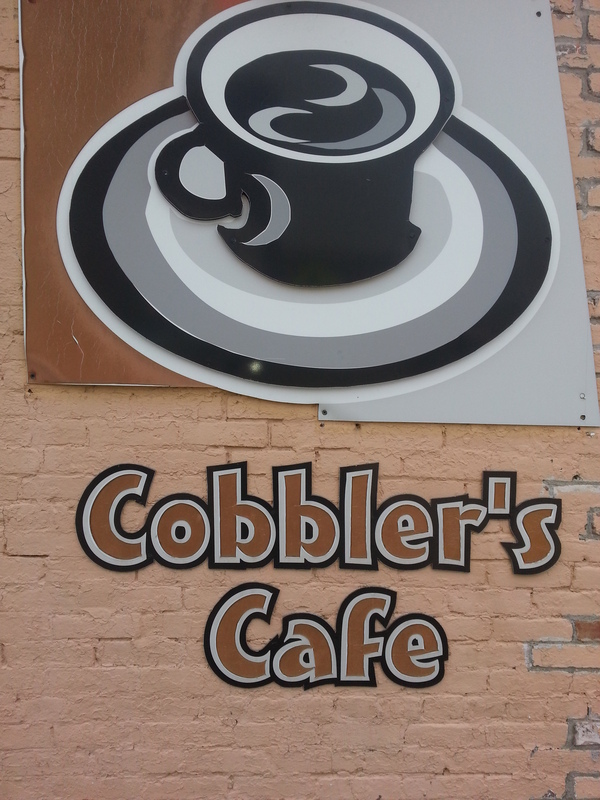 And if you’re in Kentucky, don’t miss the Cobbler’s Café! How cool to find fellow coffee travelers. I work for American Airlines (26 years) and my wife and I love coffee: both of her parents were raised in coffee farms, and her relatives still farm coffee in Puerto Rico. Two years ago we drove up the Pacific Coast from San Francisco to Oregon and found so many great coffee shops. If you are ever in Hollywood, Florida drop in for a visit at the Yellow Green Farmer’s Market. Thanks JR! If the Hunters come to Florida we’ll look you up!